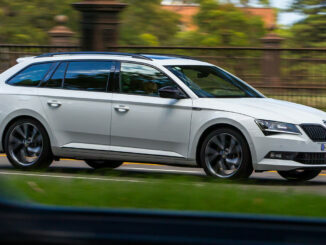 A fantastic family wagon that's a little low but great to drive! I can start by telling you the Mazda6 wagon is a fantastic car to drive! It is super smooth and responsive and just very enjoyable and easy. The interior looks great and feels luxurious. 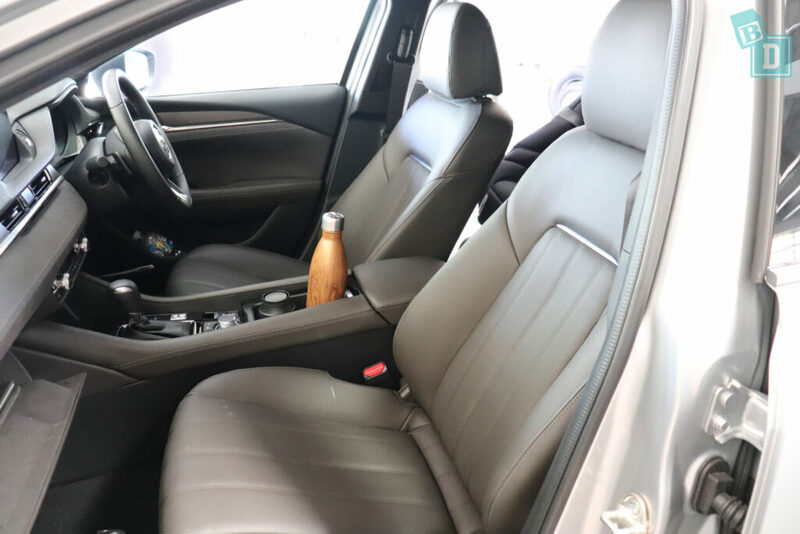 The seats are upholstered in brown leather which would be easily wiped clean except for the perforated central seat panels, which I could forgive due to the fact they provide both heated and cooled seats in this high-spec Atenza version! Such a lifesaver in our Australian summer!! I did find the dark leather seats got extremely hot when parked in the sun, so the cooling was essential! I could fit two child seats in the back of the Mazda6 wagon, which was surprising as I got three in the sedan. In this one, though, there just wasn't room for a third. 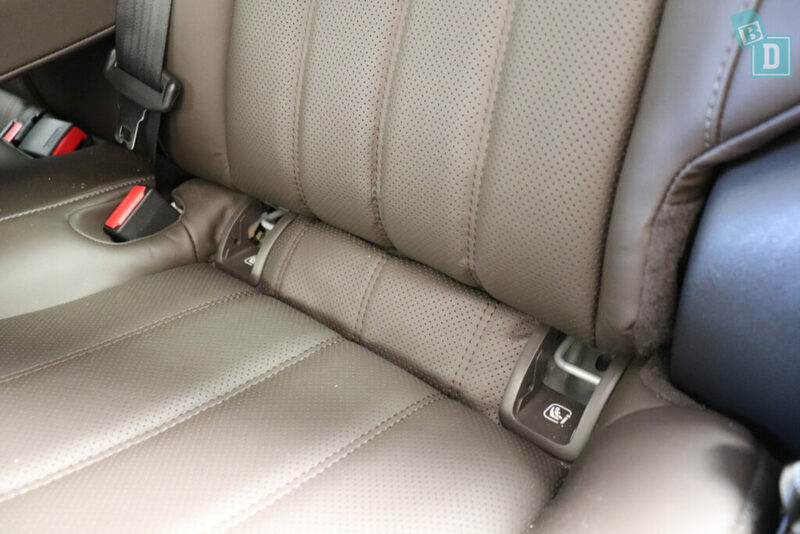 At least installing them was relatively simple, with ISOFix points in the two outer seats that are within plastic guides and are lovely and easy to connect to. 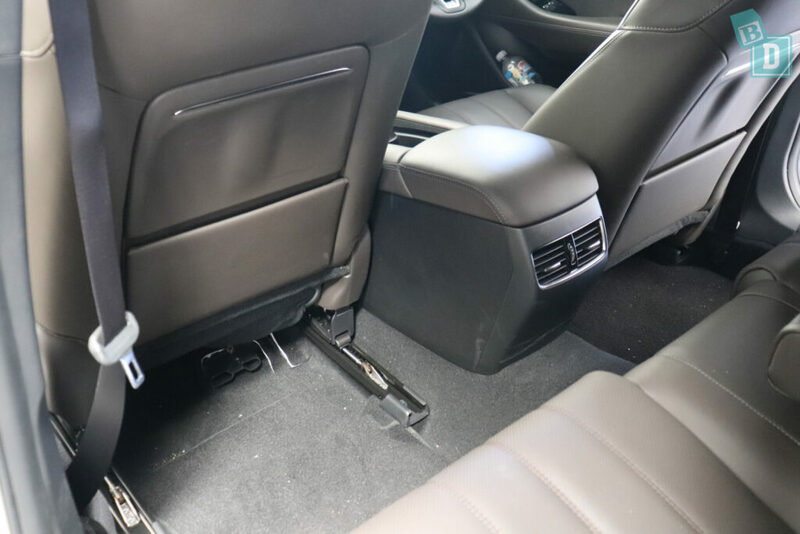 There are top tethers in the back of all three rear seats, which are also easy to access and connect to. 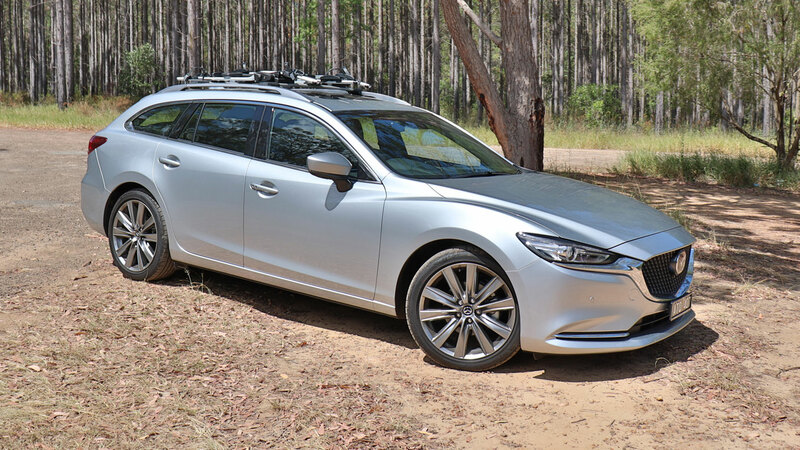 The roofline is low in the Mazda6 wagon, especially if you are used to an SUV, but we didn't encounter any bumped heads during our week with. But did notice my 186cm husband had to lower his man bun when sitting in the front and back! 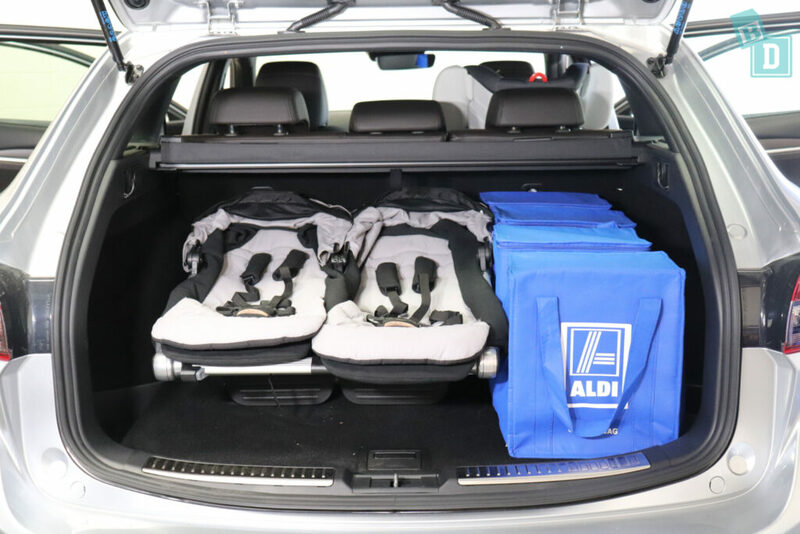 With a rear-facing child seat installed, the front passenger has 22cm of knee room, which we found was only just enough for a 180cm passenger. 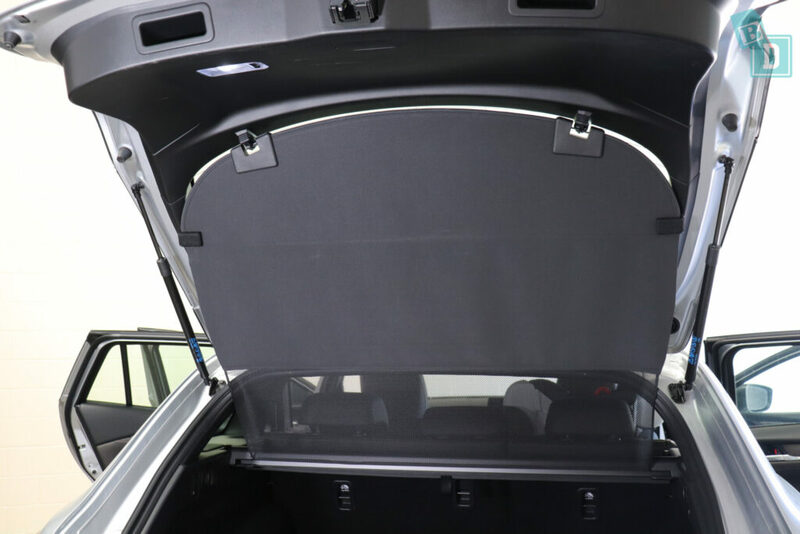 One of my favourite features of the Mazda6 wagon is the retractable roller blind in the boot! 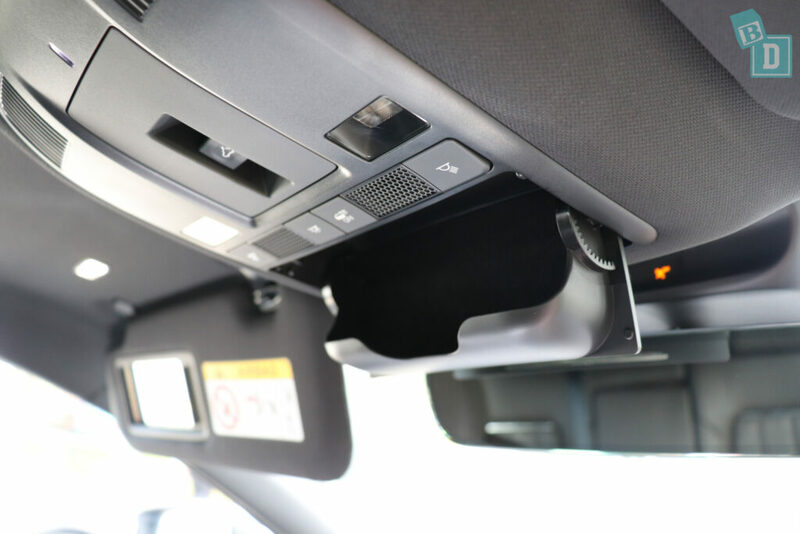 It attaches to the boot door so when you open it the retractable roller blind stays up in the air and doesn't hang down into the boot space, making it easier to load and unload the boot. 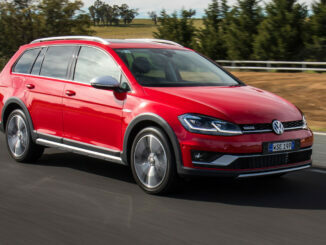 The boot is a great uniform shape and has good capacity, but not the best among similar-size wagons. 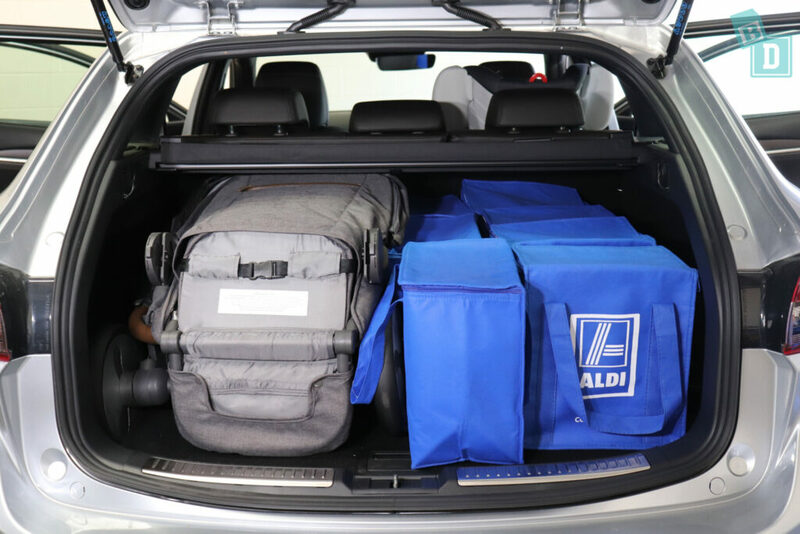 From empty it would hold fifteen shopping bags, which is one less than both the Holden Commodore Tourer and VW Passat Alltrack Wagon and three less than the Subaru Outback. 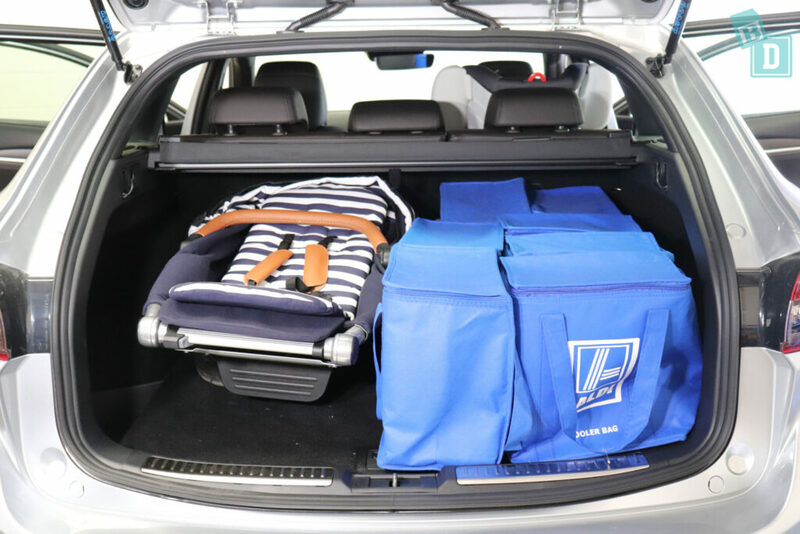 The Mazda6 wagon's boot held all styles of stroller I tested with even the biggest, the Mountain Buggy Duet twin stroller, having room for four bags beside it. 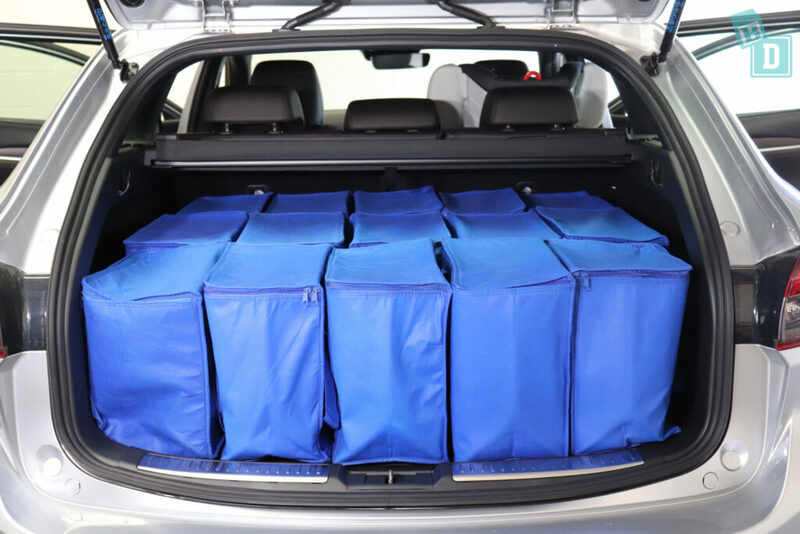 Storage is great in the Mazda6 wagon and everything fits where it needs to! There are good sized cup holders in the front and the door bins hold large refillable water bottles. There is a cordless charging well for your phone and USB, AUX and 12V connectors. 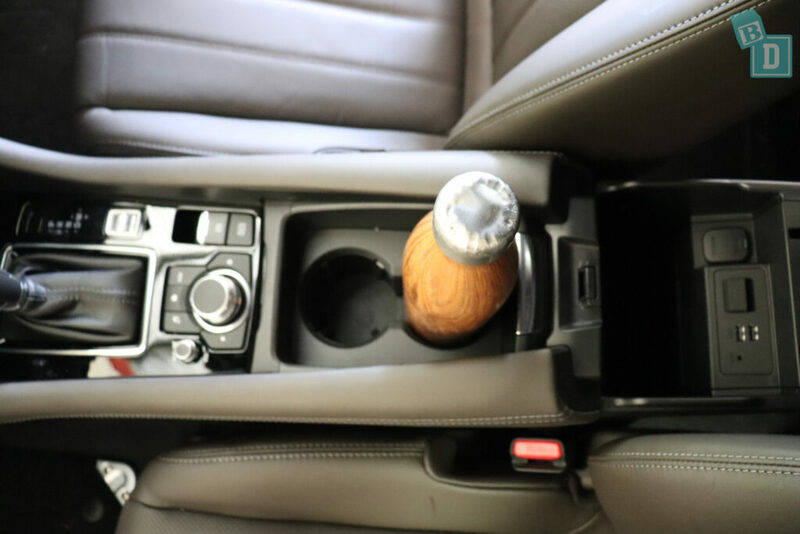 The glovebox would just hold my wallet with an iPad and the large Mazda user manual, and there are map pockets in the back of both front seats which would hold but not conceal an iPad. 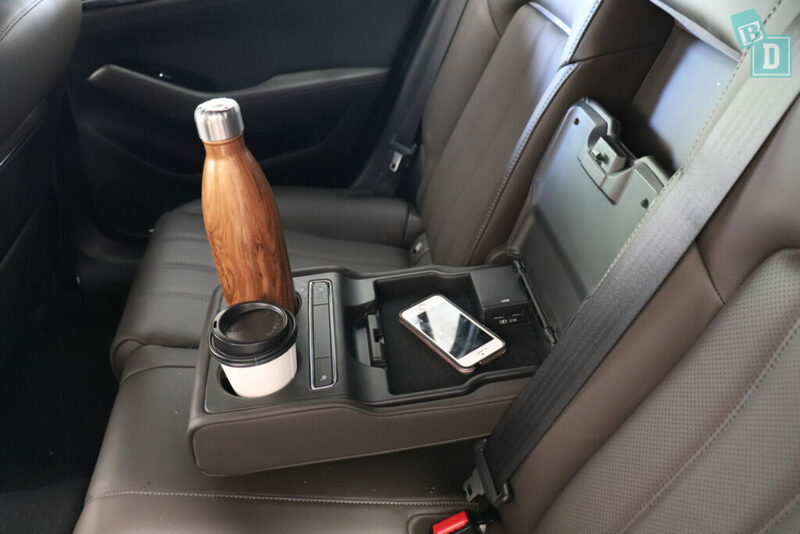 The storage does fall short in the back where there is a fold-down armrest in the central seat back which has two cup holders in and a lidded compartment with two USB ports for charging phones. However, just behind the cup holders are two seat heating buttons which for me are a real no-no with a toddler in the back. With the armrest down to hold my daughter's water cup, she was fiddling away with those buttons and heating up her seat on every journey! You use a control knob down in the central console to navigate the media system in the Mazda6 wagon, which I don't find the easiest method. The model I tested did not have Apple CarPlay and Android Auto however if you were to buy one today it would come with both and if you buy a used Mazda6 you can now have the smartphone systems added for around $500. The reversing camera has a really clear image and the different camera views were really useful, making reverse parking easier as visibility is difficult out of the back with two child seats installed. I found the Mazda6 wagon a real pleasure to drive. So simple, easy and it felt light and nimble around town and out on the open road. Overall the Mazda6 wagon is a great BabyDrive if you only need two child seats. 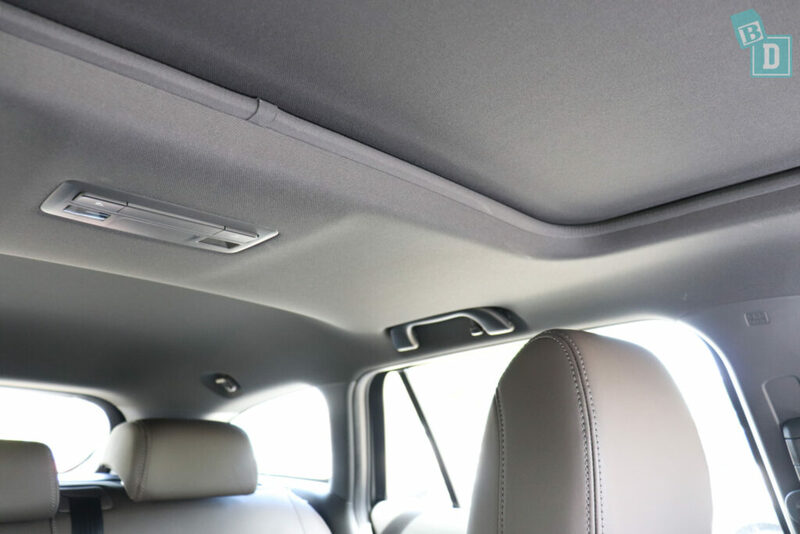 The headroom is a consideration if you are a tall family but it would be a great car for a family of four. The Mazda6 was given a five-star ANCAP safety rating in 2018 and has six airbags as standard. How big is the boot of the Mazda6 Wagon? 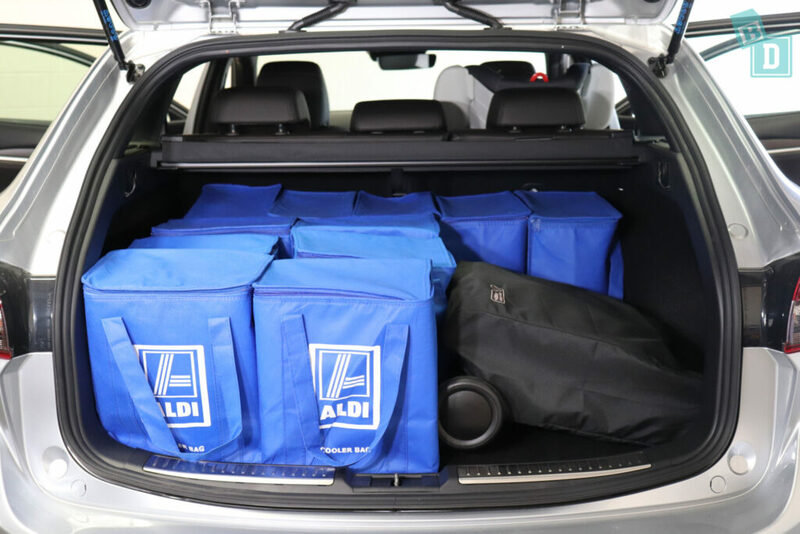 From empty, I could fit 15 shopping bags in the boot, which is one less than both the Holden Commodore Tourer and VW Passat Alltrack Wagon and three less than the Subaru Outback which holds eighteen bags. The boot space is a nice uniform shape and there is a bag hook on both sides. The Mountain Buggy Duet twin stroller fitted in the boot with four shopping bags beside it. The Mountain Buggy Nano compact stroller fitted with eleven shopping bags beside it. Or you could fit a large sized dog in the boot if you remove the retractable roller blind. 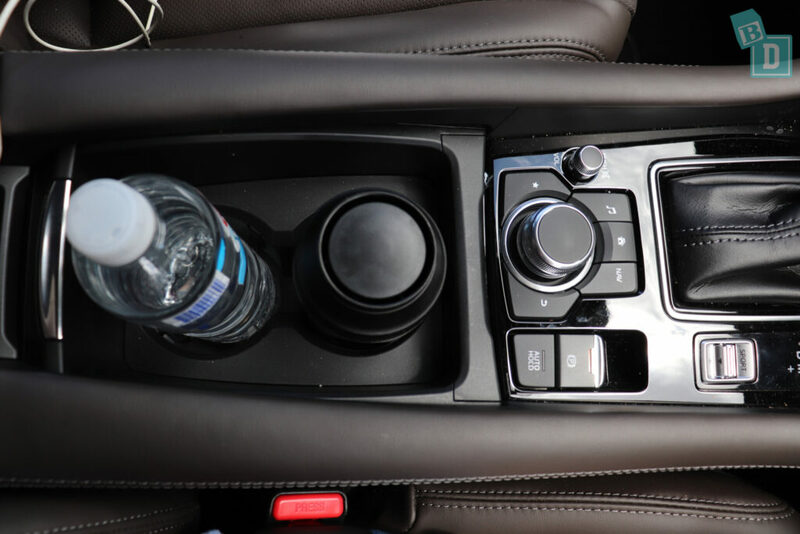 Storage in the cabin of the Mazda 6 is good in the front, where there are two cup holders in the central console that are well sized to hold a reusable or disposable coffee cup and my large refillable water bottle fitted in there too. The central console storage box is quite small but has two USB ports and AUX and 12V socket in there. There is a wireless phone charging well in front of the gear lever which was a great size for my phone. The glove box in the Mazda6 wagon is quite small but it does fit my wallet and iPad in with the large Mazda manual and is nicely felt lined. 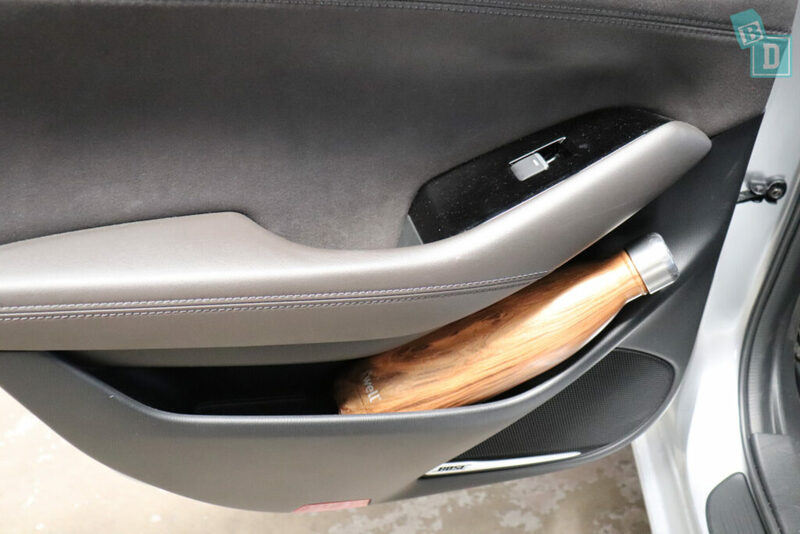 The door pockets in the front are a good size for holding a large refillable water bottle and there are little storage wells in the handles of the doors, which I find really useful for putting little things out of my daughter's hands into while I'm strapping her into her car seat. 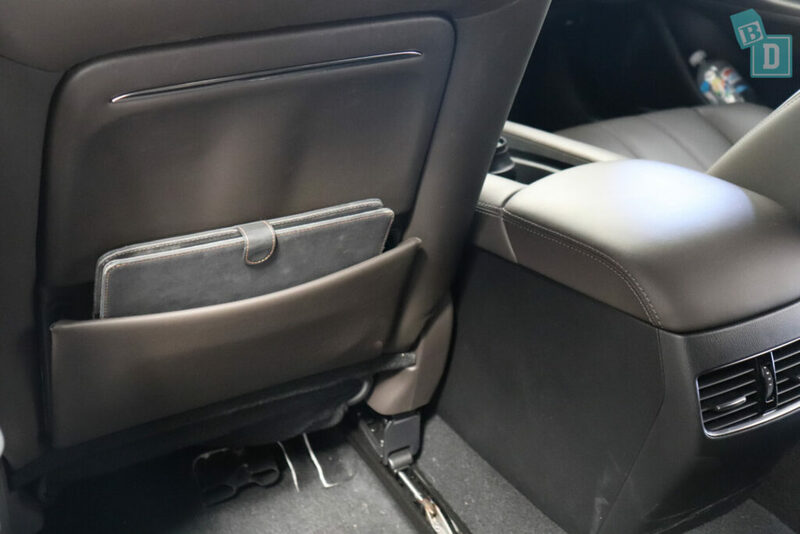 In the back of the Mazda6 wagon's front seats are map pockets they are quite shallow, so they will hold an iPad but not conceal it. The central seatback has a fold-down armrest has a lined compartment for storing and charging phones which is great. When the lid is closed in front of that are two cup holders that are well sized to hold a reusable or disposable coffee cup and a large refillable water bottle fits in there too. The bad design is the heated seat buttons are positioned here so you can't use the cup holders to hold your child's cup or bottle while you're driving along because little fingers find the heated seat buttons irresistible and, as I discovered, heat themselves up even more on a hot summers day!!! The door bins in the back will hold a large refillable water bottle too. How noisy is the Mazda6 wagon? 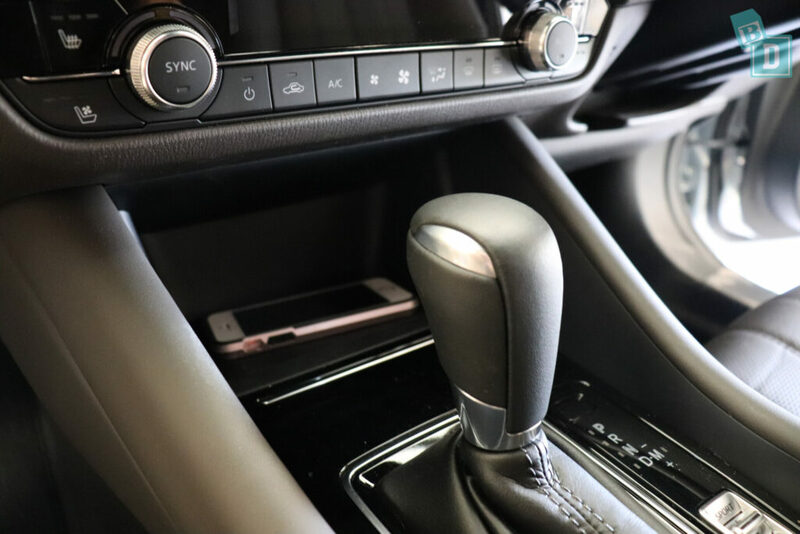 The media system in the Mazda6 wagon I tested did not have Apple CarPlay and Android Auto however if you bought a new one now it would come with both and Mazda will add these smartphone systems to a used model for about $500. I found it really easy to connect my phone to and my music did not play straight away as soon as I started the car. The Mazda media system is easy to navigate but I found the round knob in the central console frustrating. That said, it may become second-nature if you're using it every day. 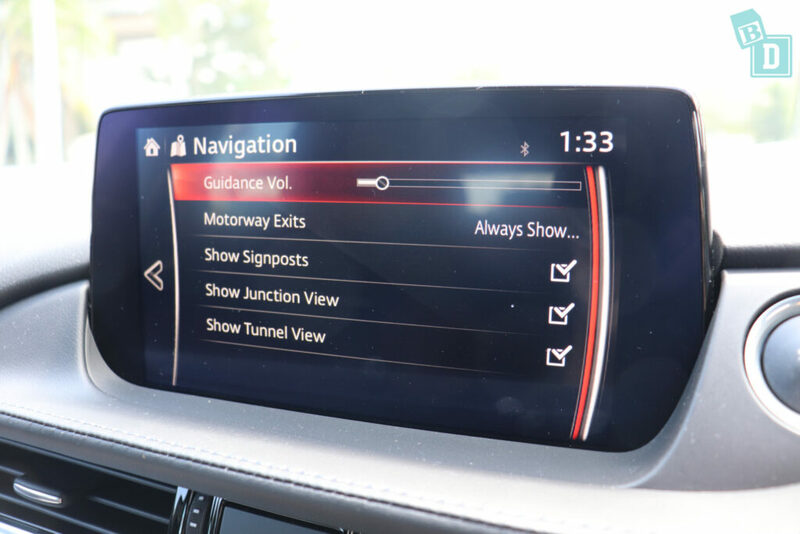 The sat-nav in the Mazda6 wagon is really simple to use, however, to mute the sat-nav voice you do have to go through a few screens until you reach the guidance volume option, which is disappointing. 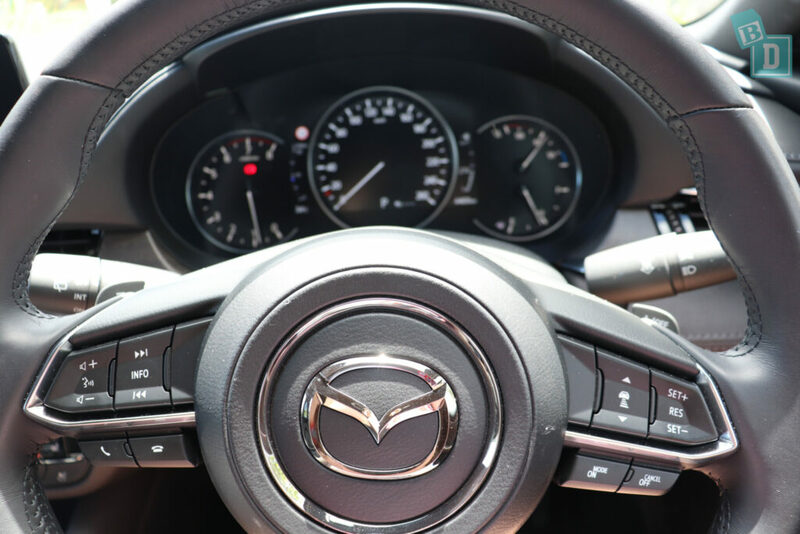 There is lane departure warning in the Mazda6 wagon, which is a vibration rather than a beeping and you can turn it off with a button by your right knee. The indicators are LOVELY and quiet too and would not disturb a sleeping baby onboard. The cruise control is really easy to use, the controls are on the right on the steering wheel and I found it to be accurate for motorway driving at fast speeds on straight roads, but at slower speeds on undulating roads it did get around 6km/h over and under the set speed when going up and down hills. There is a head-up display, projected in the windscreen, which I found really useful for watching my speed. 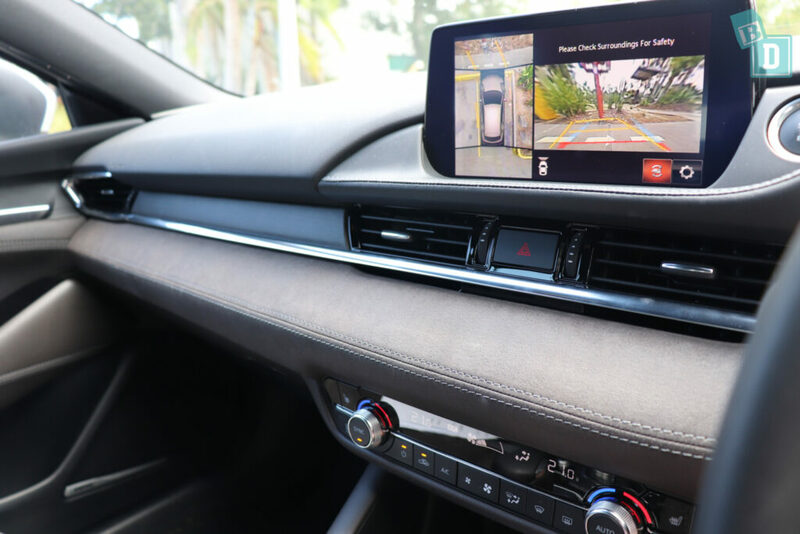 The reversing camera has an excellent quality image in the Mazda6 wagon. 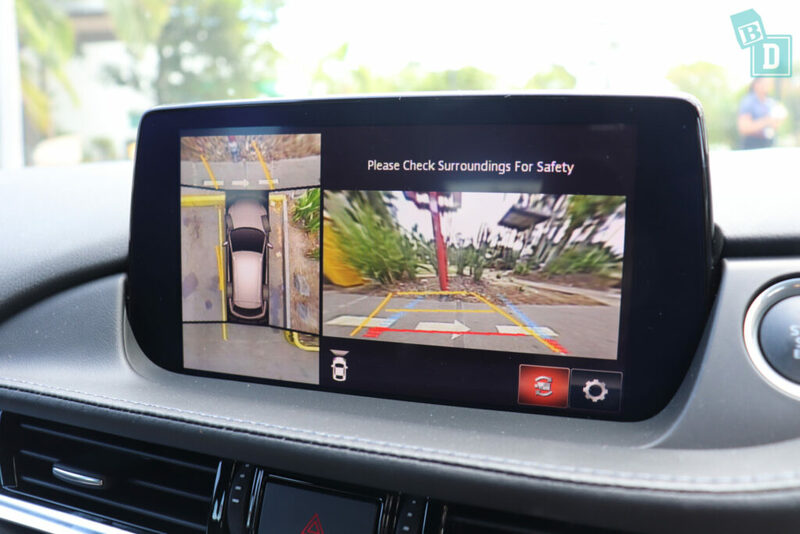 You can change the camera view with a button by your right knee and the overhead camera view is especially useful when parking, because the Mazda6 wagon has a low roofline and it's long, making visibility tricky out of the back when child seats are installed. 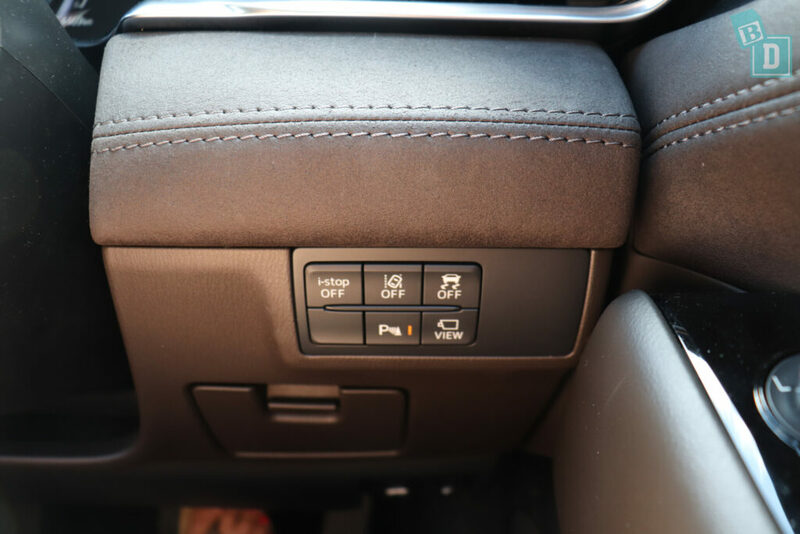 There is not a one press button on the screen to mute the parking sensors while maneuvering but there is a button by your right knee to turn the parking sensors off. The doors and windows are lovely and quiet to open and close in the Mazda6 wagon, so I don't think you'd need to worry about them waking a bub that's asleep in the back and you get in or out. I found you can come to a stop with the engine still running and get out of the car without sounding any alarms. There are seatbelt reminders for both rows so if seatbelts are undone while driving an alarm sounds and a visual is displayed in the screen in front of the steering wheel. 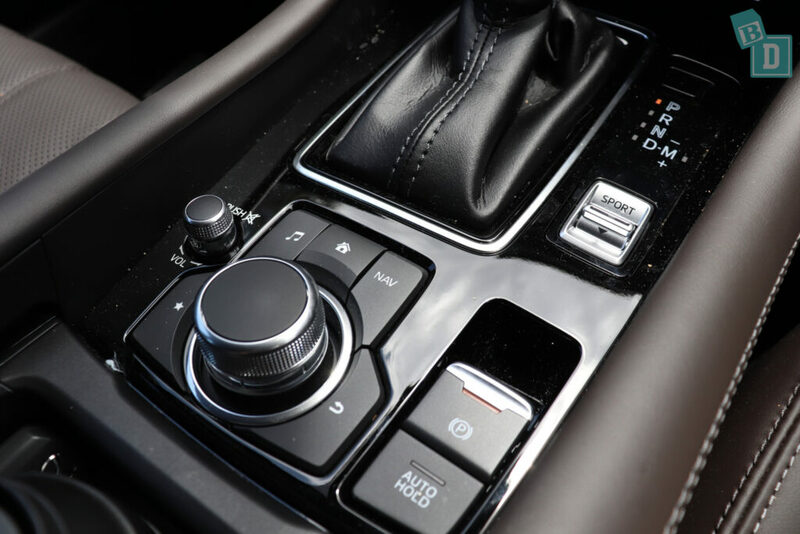 Auto engine cut-out is called i-stop in Mazdas, and the button to turn this off is by your right knee. How many child seats fit on the Mazda 6? I found I could only fit two child seats in the back of the Mazda6 wagon as there just wasn't enough room for a third child seat between them. It's odd because the Mazda6 sedan surprised me by taking three child seats quite easily. I installed the rear-facing Britax Graphene and the forward facing Britax Platinum Pro, both in the outer seats using IsoFix and top tethers. 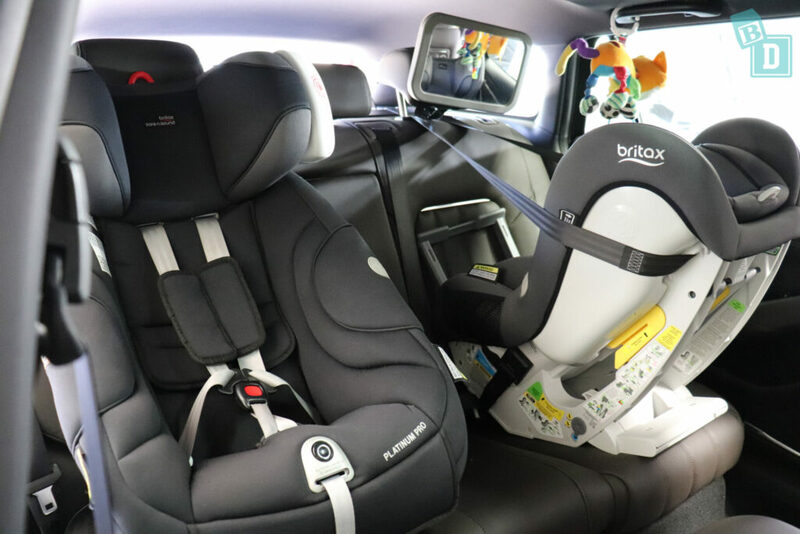 The child seats were nice and easy to install and there are ISOFix points within plastic guides on both the outer seats that are easy to connect to. There are top tethers within clearly labelled plastic guides, on the back of all three rear seat backrests, and they are nice and high up which makes them easy to connect to over the back of the seats without the need for extension straps. Posting bub into their child seat from outside the car is not as bad as in some wagons, however, the roofline is still quite low which means you are bending down to post bub in. From inside the car, the roofline is low so you do have to be careful when lifting bubs into their child seats. With rear-facing child seats installed in the back, legroom for the front passenger was not as good as I had expected, a 180cm passenger could fit but was a snug fit for both head and legroom. How comfortable is the Mazda6 wagon? One of the highlights of the Mazda6 wagon was how comfy I found it! In the front the brown leather seats have electronic adjustment and are very comfortable, both seats are heated and cooled which we found a must because the seats got soooo hot when the car was parked outside in the summer. For a mum travelling in the back with bub, the seats are comfortable, the headroom was fine for me at 162cm but for taller passengers of more than 180cm, they are brushing the ceiling. In the central seat, but you can feel the hard central backrest because of the fold-down armrest and cup holders in the central seat back. The cruise control is on the right on the steering wheel, I found it very easy to use and accurate on straight, fast motorways but it did go about 6km/h over and under the set speed at 60km/h on undulating roads. There are four air-conditioning vents across the front dashboard; two central ones and one at either end. 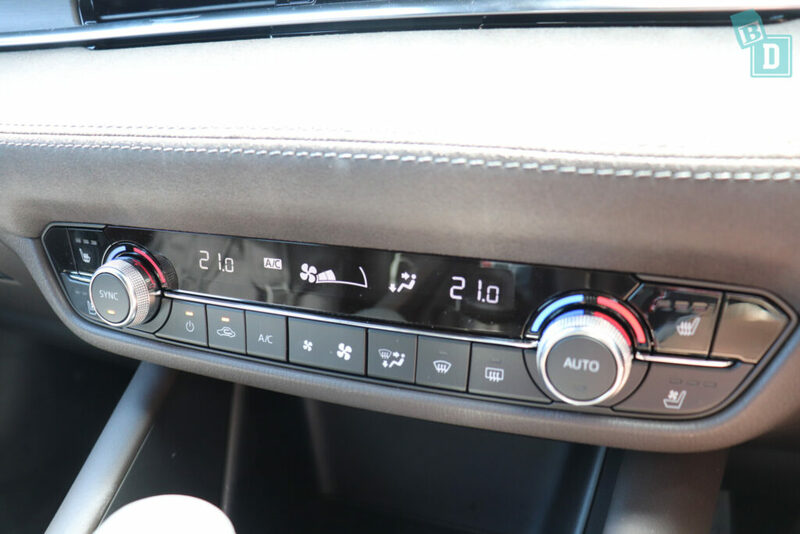 One of the things I enjoyed most in the Mazda6 wagon was the gentle airconditioning that really cooled the cabin without huffing and blowing loudly. 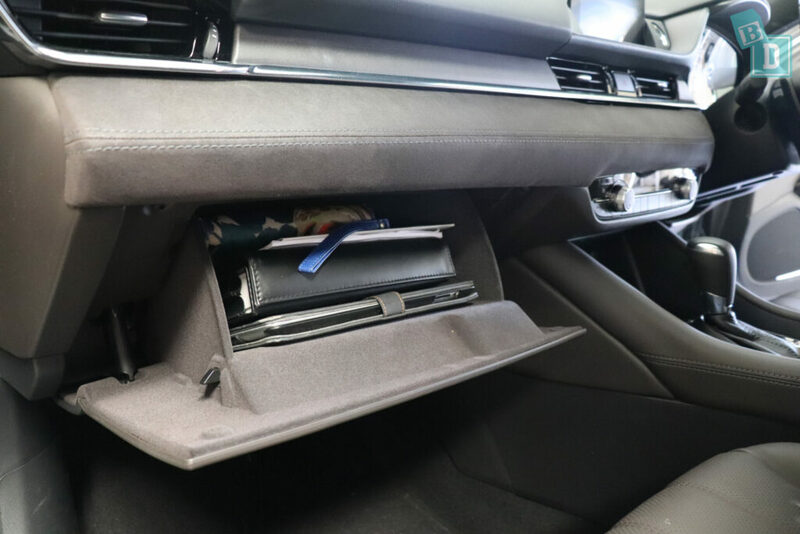 There are rear air vents in the back of the central console box that are reachable from the front while driving. My forward-facing toddler did enjoy turning them on and off with her toes!! The controls for the aircon are in a panel on the central dashboard, I found them nice and easy to locate and use while driving. The high-spec Mazda6 Atenza wagon I tested also had heated and cooled front seats as well as heated rear seats. The rear seat controls are behind the cup holders in the fold-down armrest. In a BabyDrive context, they are really badly positioned because when you have kids in the back they can fiddle with the buttons and turn their seat heating on without you being able to control it and they are slowly cooking in the back without you knowing!! The interior lights in the rear are in the ceiling centrally behind the sunroof and I found I could reach them while I was driving! 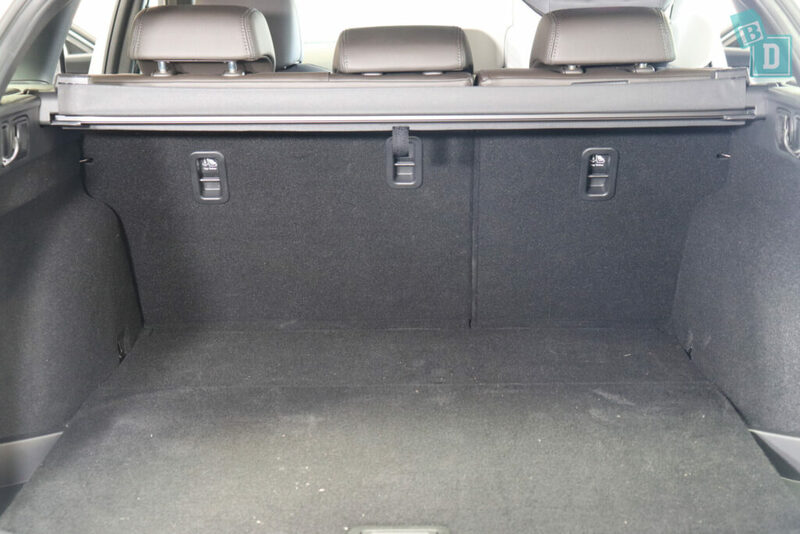 There are handles above both rear doors, which are well positioned to hold a baby toy for rear-facing passengers. There are lit vanity mirrors in both front visors and there is a lined glasses case in the ceiling too. Visibility in the Mazda6 wagon is quite difficult for the driver especially with two child seats installed in the back. 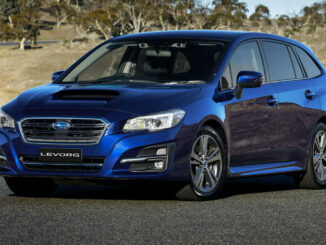 The roofline is low being a wagon and the windows aren't particularly deep, especially towards the back. This affects vision for the driver and for rear-facing passengers to see out. One thing I have noticed since being a mum is I hate it when I reach a destination or get home from being out and Tulsi has either done really well in the car or she is screaming her head off and I have done really well to keep it together for the entire journey (usually the latter!!) and it takes 10 minutes to park the car! It can be really stressful. Usually I dread parking new cars as they take longer in our tight apartment block carpark, but the Mazda 6 was okay to park, the visibility was limited but the excellent reversing camera definately helped make it easier! 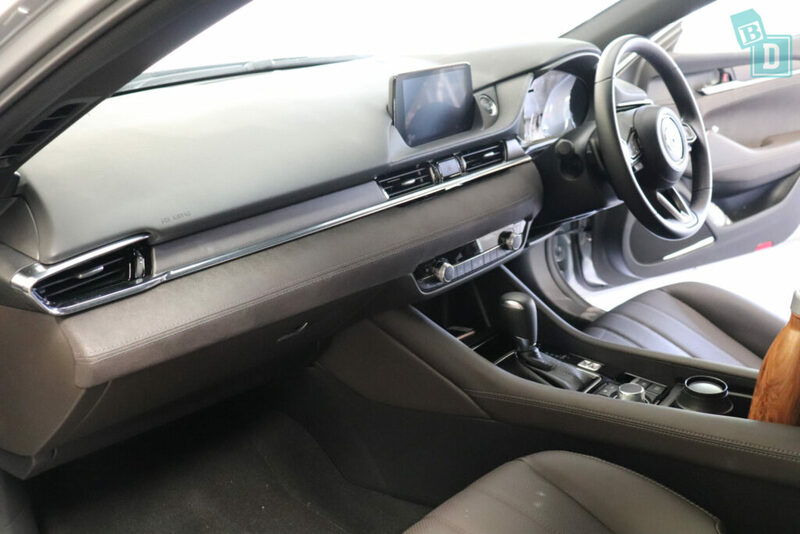 The Mazda6 wagon has a beautiful interior with a quality feel, although the perforated seats of the Atenza model I tested would make it harder to keep them clean. There are carpet floor mats throughout the Mazda6 wagon. The Mazda6 wagon really is a pleasure to drive, it's very smooth, silent and relaxed, both around town and out on the faster roads. The Mazda6 Atenza wagon I tested did have keyless entry. How safe is the Mazda 6 wagon? The Mazda 6 scoured a five-star ANCAP safety rating in 2018. For child occupancy, it scored 91%, for adult occupancy it scored 95% and for pedestrians 66%. In the adult occupancy testing, it scored 7.49 out of 8 for the frontal offset test, 6.82 out of 8 for the full-width frontal testing, 8/8 for both the side impact and oblique pole tests, 1.83 out of 2 in whiplash protection and 4/4 for AEB city. In the child occupancy testing the Mazda 6 scored full marks for the dynamic front and side crash tests, 11.81 out of 12 for child restraint installation and 9 out of 13 for onboard features. ANCAP reported- Protection was GOOD for all critical body areas for the 6-year-old and 10-year-old dummies in both the frontal offset and side impact tests. The Mazda 6 is fitted with lower ISOFix anchorages for the rear outboard seats and top tether anchorages for all rear seats. 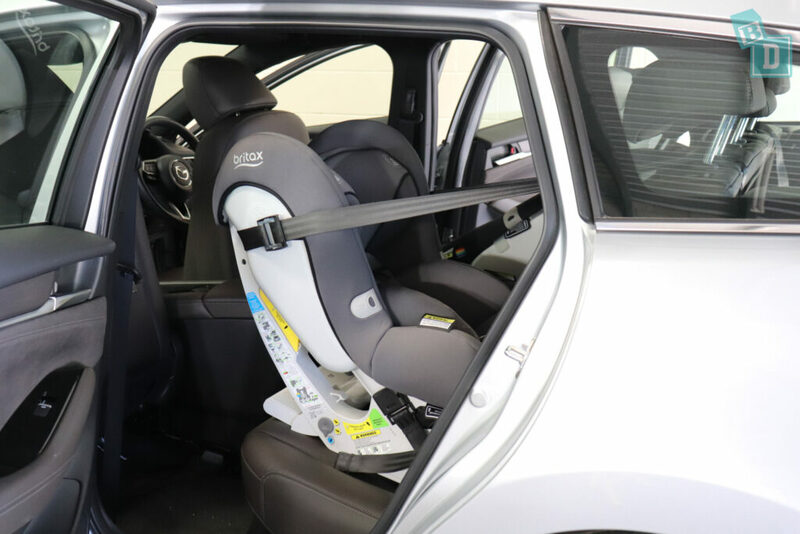 Installation of typical child restraints available in Australia and New Zealand showed that most child restraints could be accommodated in rear seating positions, though one of the selected booster seats could not be correctly installed in the centre rear seating position. Six airbags come as standard; there are dual frontal airbags and side chest-protecting airbags for the front passengers and side head-protecting curtain airbags for the rear side passengers. All models of the Mazda6 come with front and rear seatbelt reminders. As standard, all models of the Mazda6 come with adaptive cruise control (ACC), anti-lock braking system (ABS), autonomous emergency braking (AEB) city, interurban and VRU, automatic headlights, automatic high beam, blind-spot monitoring (BSM), electronic brakeforce distribution (EBD), electronic data recorder (EDR), electronic stability control (ESC), emergency brake assist (EBA), emergency stop signal (ESS), fatigue reminder, forward collision warning (FCW), hill launch assist, lane departure warning LDW, lane keep assist (LKA), rear cross-traffic alert (RCTA), speed assistance manual and auto/intelligent speed limiter, speed sign recognition and warning. Additional safety features daytime running lights (DRL) and adaptive headlights are both standard on all but not the base variant.